Ramoji Film City in Hyderabad is the largest film studio in the world. A film studio (also known as movie studio or simply studio) is a major entertainment company or motion picture company that has its own privately owned studio facility or facilities that are used to make films, which is handled by the production company. The majority of firms in the entertainment industry have never owned their own studios, but have rented space from other companies. There are also independently owned studio facilities, who have never produced a motion picture of their own because they are not entertainment companies or motion picture companies; they are companies who sell only studio space. The largest film studio in the world is Ramoji Film City, in Hyderabad, India. 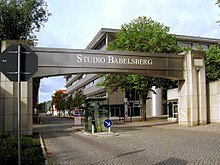 The Babelsberg Studio near Berlin was the first large-scale film studio in the world and the forerunner to Hollywood. It still produces movies every year. In 1893, Thomas Edison built the first movie studio in the United States when he constructed the Black Maria, a tarpaper-covered structure near his laboratories in West Orange, New Jersey, and asked circus, vaudeville, and dramatic actors to perform for the camera. He distributed these movies at vaudeville theaters, penny arcades, wax museums, and fairgrounds. The first film serial, What Happened to Mary, was released by the Edison company in 1912.The pioneering Thanhouser film studio was founded in New Rochelle, New York in 1909 by American theatrical impresario Edwin Thanhouser. The company produced and released 1,086 films between 1910 and 1917, successfully distributing them around the world. In the early 1900s, companies started moving to Los Angeles, California. Although electric lights were by then widely available, none were yet powerful enough to adequately expose film; the best source of illumination for motion picture production was natural sunlight. Some movies were shot on the roofs of buildings in Downtown Los Angeles. Early movie producers also relocated to Southern California to escape Edison's Motion Picture Patents Company, which controlled almost all the patents relevant to movie production at the time. The first movie studio in the Hollywood area was Nestor Studios, opened in 1911 by Al Christie for David Horsley. In the same year, another 15 independents settled in Hollywood. Other production companies eventually settled in the Los Angeles area in places such as Culver City, Burbank, and what would soon become known as Studio City in the San Fernando Valley. By the mid-1920s, the evolution of a handful of American production companies into wealthy motion picture industry conglomerates that owned their own studios, distribution divisions, and theaters, and contracted with performers and other filmmaking personnel, led to the sometimes confusing equation of "studio" with "production company" in industry slang. Five large companies, 20th Century Fox, RKO Pictures, Paramount Pictures, Warner Bros., and Metro-Goldwyn-Mayer came to be known as the "Big Five," the "majors," or "the Studios" in trade publications such as Variety, and their management structures and practices collectively came to be known as the "studio system." Although they owned few or no theaters to guarantee sales of their films, Universal Pictures, Columbia Pictures, and United Artists also fell under these rubrics, making a total of eight generally recognized "major studios". United Artists, although its controlling partners owned not one but two production studios during the Golden Age, had an often-tenuous hold on the title of "major" and operated mainly as a backer and distributor of independently produced films. Smaller studios operated simultaneously with "the majors." These included operations such as Republic Pictures, active from 1935, which produced films that occasionally matched the scale and ambition of the larger studio, and Monogram Pictures, which specialized in series and genre releases. Together with smaller outfits such as PRC TKO and Grand National, the minor studios filled the demand for B movies and are sometimes collectively referred to as Poverty Row. The Big Five's ownership of movie theaters was eventually opposed by eight independent producers, including Samuel Goldwyn, David O. Selznick, Walt Disney, Hal Roach, and Walter Wanger. In 1948, the federal government won a case against Paramount in the Supreme Court, which ruled that the vertically integrated structure of the movie industry constituted an illegal monopoly. This decision, reached after twelve years of litigation, hastened the end of the studio system and Hollywood's "Golden Age". By the 1950s, the physical components of a typical major film studio had become standardized. Since then, a major film studio has usually been housed inside a physically secure compound with a high wall, which protects filmmaking operations from unwanted interference from paparazzi and crazed fans of leading movie stars. Movement in and out of the studio is normally limited to specific gates (often capped with grand decorative arches), where visitors must stop at a boom barrier and explain the purpose of their visit to a security guard. Studio premises generally feature multiple sound stages along with an outside backlot, as well as offices for studio executives and production companies. There is normally a studio "commissary", which is the traditional term in the film industry for what other industries call a company cafeteria. Early nitrate film was notoriously flammable, and sets were and are still very flammable, which is why film studios built in the early-to-mid 20th century have water towers to facilitate firefighting. Halfway through the 1950s, with television proving to be a lucrative enterprise not destined to disappear any time soon—as many in the film industry had once hoped—movie studios were increasingly being used to produce programming for the burgeoning medium. Some midsize film companies, such as Republic Pictures, eventually sold their studios to TV production concerns, which were eventually bought by larger studios, such as the American Broadcasting Company which was purchased by The Walt Disney Company in 1996. With the growing diversification of studios into such fields as video games, television stations, broadcast syndication, television, theme parks, home video and publishing, they have become multi-national corporations. As the studios increased in size they began to rely on production companies, like J.J. Abrams' Bad Robot Productions, to handle many of the creative and physical production details of their feature films. Instead the studios transformed into financing and distribution entities for the films made by their affiliated production companies. With the decreasing cost of CG and visual effects, many studios sold large chunks of their once massive studio spaces or backlots to private real-estate developers. Century City in Los Angeles was once part of the 20th Century Fox backlot, which was among the largest and most famous of the studio lots. In most cases portions of the backlots were retained and are available for rental by various film and television productions. Some studios offer tours of their backlots, while Universal Pictures allows visitors to its adjacent Universal Studios Hollywood theme park to take a tram tour of the backlot where films such as Psycho and Back to the Future were once shot. In the 1980s and 90s, as the cost of professional 16mm film equipment decreased, along with the emergence of non-film innovations such as S-VHS and Mini-DV cameras, many young filmmakers began to make films outside the "studio system". Filmmakers and producers such as Mike Judge, Adam Sandler, Jim Jarmusch, Robert Rodriguez, Steven Soderbergh, Quentin Tarantino, Kevin Smith and Richard Linklater made films that pushed boundaries in ways the studios were then reluctant to do. In response to these films, many distributed by "mini-studios" like Miramax the "majors" created their own in-house mini-studios meant to focus on edgier "independent" content. Focus Features was created by Universal Pictures and Fox Searchlight was created by 20th Century Fox for this purpose. ^ a b "Guinness world record". ^ "China to build world's most expensive film studio". Wikimedia Commons has media related to Film studios. Who built the first film studio in the United States?